In the United States, you’re more likely to experience a flood than any other natural emergency. It’s the country’s most common natural disaster, and many people don’t realize they’re at risk until it’s too late. For those who don’t think massive floods happen where they live, it takes only six inches of flood water to knock a grown man off his feet, and two feet of floodwater to sweep away an SUV. Small floods can cause massive damage to homes, sweep a vehicle away, or even take a life. This guide will explain how a flood happens, how to prepare for this type of disaster, and how to act if it happens in your area. Flooding is caused by a number of things and typically occurs when the ground is saturated to the point that it can no longer absorb more water. Water then rushes over banks and down streets, becoming a force that can be destructive and deadly. Heavy rains that last anywhere from a few hours to a few days saturate the ground so much that water has nowhere to go. Waterways – like streams, rivers and lakes – cannot contain rain and/or snowmelt, resulting in overflow. Waterways become blocked with debris or ice, water backs up and diverts its path, often flooding the nearby banks. Water systems break, including levees and dams, as well as sewer and public water systems. Storm surges push seawater onto land, flooding coastal areas and beyond. Unless you live on top of a mountain, you’re at risk for some level of flooding – even if it’s minimal. Although it’s human nature to want to live near water, doing so makes you more prone to flood risk. Those most prone to flooding live near waterways like streams and rivers, along the coast, and downriver from a dam or levee. Coastal Regions: From June through November, coastal areas have a higher risk of flooding due to hurricane season. Midwest: Spring and summer rains become heavy and may cause flooding in the Midwest. Northeast and Northwest: These areas are more at risk to flooding during the winter months or early spring, when ice jams divert water flow or when rivers and streams overflow from snowmelt. Southwest: Late summer is the highest risk of flooding for those in the Southwest because of monsoon season. Preparing for floods, as well as other natural disasters, is necessary for multiple reasons. It keeps your family safe, protects your valuables and important documents, and gives you a plan – which is more likely going to keep you calmer and more relaxed during the emergency situation than you would be otherwise. Standard homeowner’s insurance does NOT cover floods – that means even if furniture is destroyed, carpet ruined, and walls so saturated they need to be replaced, your homeowner’s insurance will not compensate you. Flash floods, which occur when water levels rise quickly in low-lying areas or around streams and rivers, are the number-one cause of weather-related deaths in America. Over half of all flood-related drownings occur when a vehicle is driven into floodwaters. The second cause of drowning flood deaths is caused when walking in or near floodwaters. When you are prepared for any disaster, including flooding, you’re not only increasing the chances of your family’s safety, you’re also reducing the damage – physical, financial and emotional – that the disaster leaves in its path. First and foremost, each family and household should have an emergency preparedness kit. 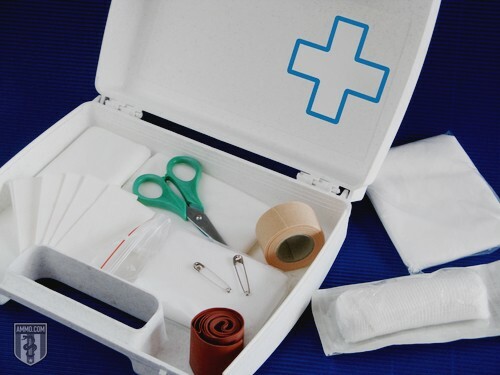 This kit should have everything you need to survive for at least three to five days, ways to keep in contact with the outside world, and enough medical supplies to handle emergencies to the best of your ability. If someone in your family or among your close neighbors has a small child, a disability, or is elderly, ensure you meet their specific needs. This goes for pets as well. It’s your responsibility to make sure they remain safe during a flood, so be sure to have food, medications, leashes, water, and a way to transport them if an evacuation is ordered. If you’re plan is to go to a shelter, have the phone number for local kennels, as emergency shelters do not allow animals. Most counties have a county planning department that can be contact about any flood concerns. Staff at this facility can verify if you’re located in a flash flood-prone area or a flooding zone, how likely flooding is, and where the local Red Cross is located. The planning department should also be able to give you information about your community's emergency plans, including warning notifications, evacuation plans, and the location of emergency shelters. Because most home insurance policies don’t cover flood insurance, consider purchasing additional coverage. And if you live in a high-risk flood zone, it may be a requirement. To know your home’s risk, FEMA has created Flood Insurance Rate Maps, referred to as FIRMs, which details each area’s risk for flooding. Homes and businesses at the highest risk means there’s a one in four chance of a flood during a 30-year mortgage, and are federally required to carry specific flood insurance. The National Flood Insurance Program offers affordable flood insurance to home and businesses owners in flood zones. This program also works with local communities to ensure they’re following the best possible flood management plans and improving infrastructure to lower the risks and damages from floods. While you may think bunkering down and staying at home is the best bet during an emergency, you need to evacuate if mandated by local government – which often has more information about the pending flood than the general public. Plus, if a massive flood does come through, you being there only puts you at more risk. You can’t save your house in the middle of a flood, so you’ve got to save yourself. While most communities have their own specific evacuation plan, make certain your family has one of its own, along with plan B and plan C routes. This ensures you multiple options if you can’t make it out due to flooded roads, fallen trees, or downed power lines. At least once a year, follow these routes to make sure they’re open and functioning roads. Also be sure to have an out-of-state emergency contact and ensure each person in your household has that person’s name, telephone number, and address. In an emergency, this person acts as the family’s primary contact. If you become separated, this is the person that each family member checks in with to verify safety. Keep gutters and downspouts free of debris. Complete a household inventory, both on paper and through pictures or video, detailing what you own, how valuable things are, and their condition. Know your household hazards and how to shut off utilities, including the electricity, water, and gas lines. Buy and install sump pumps with battery back-ups in your basement; check them every four to six months to ensure they’re in good working order. Have an electrician raise all electrical components on the lower floors of your home to at least 12 inches above the typical projected flood elevation. Install backflow valves and/or plugs on all drains, toilets, and sewer connections in your home to stop sewage and flood waters from backing up into and out of the household drains. If you live in a frequently flooded area, be sure to stay up to date on your tetanus shots, as you’re bound to come across old metal while cleaning up flood debris. If possible, put homes and outbuildings on stilts, raising them above flood levels. If you have young children, be sure to talk to them about the dangers of flood water; many don’t realize the force and power behind a flood and attempt to play in the water. If there’s a possibility of a flood, preparedness goes beyond an emergency kit and evacuation route. First, you should learn the difference in emergency weather announcements so you know how at risk you are. The National Weather Service is responsible for issuing flooding watches and warnings, which are typically announced on local television channels, public radio, and NOAA weather radios. A flood or flash flood watch is issued when the conditions are right and there is possibility of a flood, while a flood or flash flood warning occurs when there is a flood in process or about to happen. Elevate what you can, including photo albums, important documents, and anything else that can be moved to an upper level of the home. Put important things in waterproof containers. Clear debris laying around the yard so it’s less likely to cause damage. Anchor fuel tanks and anything that is not securely attached to the ground. Secure any items that are not structurally stable. Place sandbags around your property to divert water, slow its force, and stop debris from crashing into your yard and home. If ordered to evacuate, be sure to shut off electric, gas, and/or water as issued by local government. Fill the bathtub, sink, and water bottles with fresh water; be sure to sanitize the tub and sinks with bleach before filling. Ensure your vehicle’s gas tank is filled in case of an evacuation. Double check to make sure you have all your important documents. Listen to local TV or radio, or a NOAA radio, for weather updates. If your community issues them, listen for warning sirens. Keep pets safe with you during a potential flood. If you have livestock that can’t be transported to higher ground, let them loose to give them the best chance of survival; they may be tempted to linger in barns and farm yards and need encouragement to head for higher ground. If ordered to evacuate, do so as quickly as possible. Don’t ask questions and don’t second guess the decision. Take only what you need and disconnect all electrical appliances. If you happen to encounter flooded roads on your evacuation route, turn around and take a different route. No matter what, do not drive through flood water. If, for whatever reason, you didn’t evacuate, or you accidently get caught in a flood, there are still things you can do to protect yourself and your family. Never, under any circumstances, walk through flood water if it’s higher than your ankles. It only takes six inches of water to take you off your feet. Instead, head for higher ground. If you’re hoping to stay in your home, get to the highest floor – but do NOT go into a closed attic. If water levels get too high, you may get trapped inside with no way to exit the building. If necessary, and only if necessary, climb onto the roof. Never try to swim to safety, instead wait to be rescued. Flood waters are filled with unseen debris that can hit you, pull you under the water, or even knock you unconscious. If you happen to be in a vehicle during a flood, remember never to drive through floodwater. It only takes 12 inches of water to pull a compact car away and only two feet of water to sweep away large vehicles. 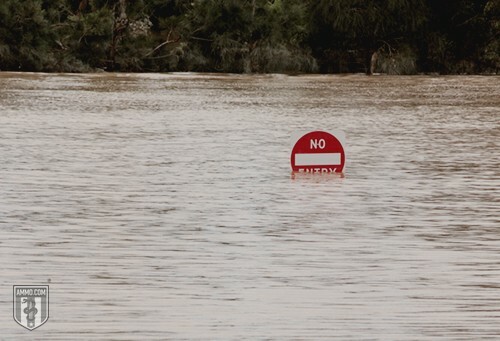 If the water level is rising and you’re unable to move the vehicle – or if it stalls and struggles to restart – abandon the car or truck immediately and head toward higher ground. But if the water is too deep and strong, don’t risk leaving the vehicle. Instead stop, call 911, and remain inside (climbing onto the roof if water starts to enter). If higher ground is not available, find a tall, sturdy object (such as a tree) and climb as high onto it as you can. If you’ve never been through a flood, you may think that once the water resides, the problems are over. But for many, they’re just beginning. To continue to protect your family and your home, it’s important you don’t return until local authorities say it’s okay. 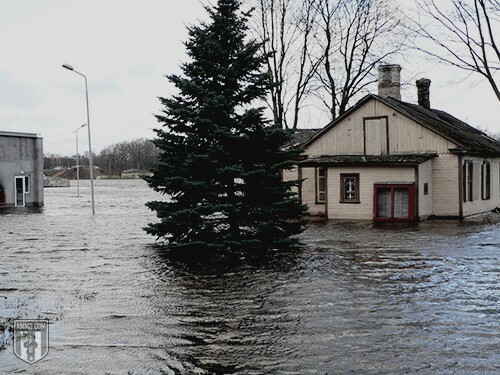 The impact of the flood on your home and property is affected by a lot variables, including the water level the flood reached, how long the water lingered, how polluted the water was, and how forcefully it flowed. After a flood, standing water that remains is often polluted with mud, debris, oil, gas, and sewer water. Floods often cause erosion, which impacts roads, walkways, and bridges; be very careful when working on or around these structures. Just as flood waters erode roads, they also impact the structures of buildings, making them weak enough to collapse without warning. Floods increase the likeliness of landslides and mudslides, so if you live in an area that’s at risk for these disasters, be aware. Wild animals often lose their homes during a flood and seek shelter wherever they find it; snakes, especially, are often seen in homes and surrounding areas during and after floods. Once you’re able to return home, the first thing you need to do is assess the damage. Only a few inches of water can cause tens of thousands of dollars in repairs and replacements. Call your flood insurance company immediately to file a claim. And be sure to take pictures of the water level and damage as soon as possible for the insurance company to review. If there is standing water that you must walk through, but can’t see into, use a stick to push through the water in front of you. This alerts you of large debris or unseen risks. Use a flashlight, never a candle, lantern, or other open flame – in case a gas leak is present. Throw away any food, even canned items, that have been in contact with flood waters or been kept at unsafe temperatures due to flooding. Check leech beds, septic tanks, or sewer systems for leaks or damage. Have your well tested before drinking or cleaning with the water. Disinfect every surface that was in contact with flood water; mold and bacteria hide everywhere. Remove any carpet that got wet or moist during the flood. Wood and drywall that got saturated with floodwater should be removed and replaced, allowing the framing behind it to completely dry before replacing. Do not turn on electricity until it’s been verified safe by an electrician. While working in the flooded area, be sure to wear protective gear including gloves, boots, and perhaps a facemask. If you have yet to deal with a flood, there’s no better time to prepare than now. With a few simple phone calls, preparing a disaster emergency kit, and knowing what to do when there is a flood in process, you can reduce the damage to your property, your bank account, and your family. Start your flood disaster plan today, before it’s too late and you’re wishing you’d been prepared.